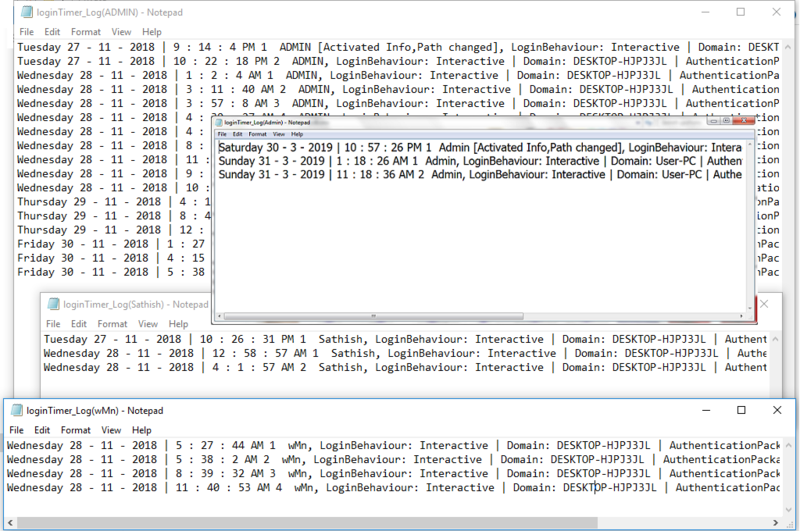 loginTimer is a portable application which displays computer login times, date, number of successful login per day, LoginBehaviour, Domain, AuthenticationPackage, Server. Audit own login times as well as other users or User Account who may sometimes work in your system by local or remote. Only one user can activate and change path with Administrator mode. Once activated then no other user can do anything. loginTimer Pro version: The first Demo user or new user should only have the priority to activate. Operating System: Windows NT, 2000, XP, 2003, Vista, Server 2008, 7, 8, 10 32/64 bit. Demo Version: 30 Days all functionality. About Demo version: On first time activation, loginTimer taking the present date format (DD-MM-YYYY) or already defined in the system of current User Account. From this format only it continues to works up to 30 days. If the user changed a different format (YYYY-DD-MM) it returns stops the demo version in the present User Account.